Since our footballing travels take us to a range or weird and wonderful places following the Whitecaps at all the various levels and watching the local soccer scene, we started a “Groundhopping” feature to take a look at some of the more characteristic football stadia that we end up watching from in the US and Canada. We hope you enjoy our journeys as much as we do. Our recent vacation down the Oregon coast enabled us to take in four football matches in the state of Washington on the way to and on the way home from all the fun at the beach. That’s how everyone works out their family holidays right? The final stop on our trip was on the way up the road to Vancouver after the Cascadia Cup classic at the Clink. 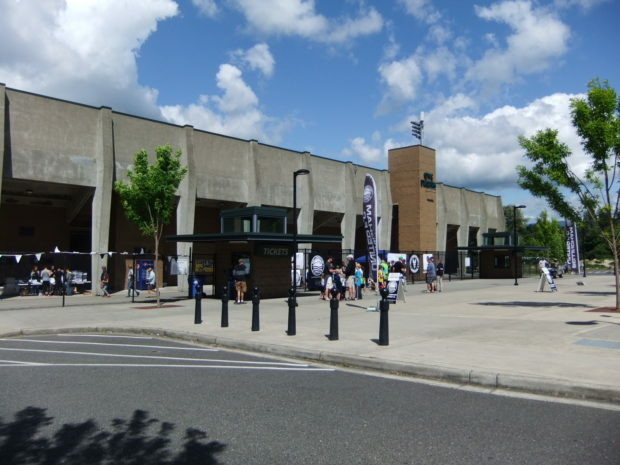 After all the MLS and PDL excitement, Civic Stadium in Bellingham was the setting for some more Cascadian rivalry and Pacific Coast Soccer League (PCSL) action between Bellingham United and Coquitlam Metro-Ford. Bellingham United were only formed in 2011, but they have made great strides in their two year existence, finishing third in the regular season table in their debut season and currently topping the standings in their sophomore season. 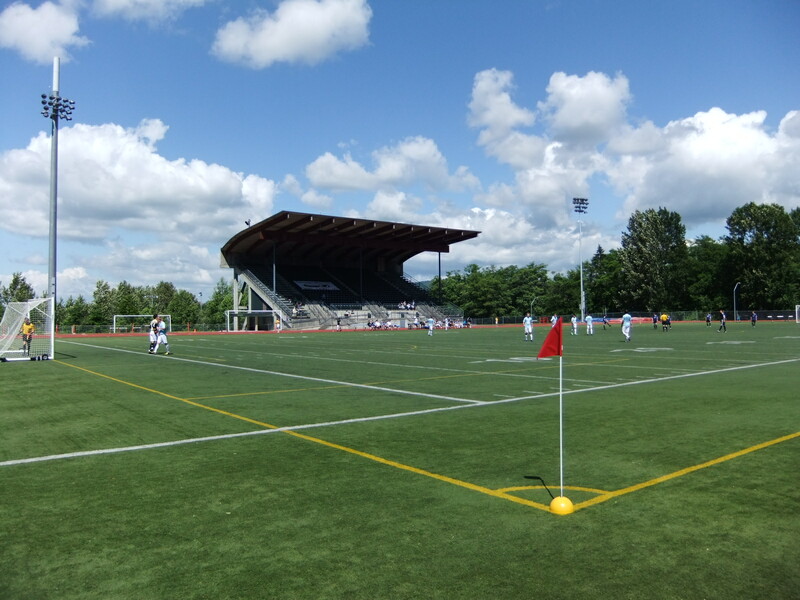 The club was formed with the aim of bringing a new premier level of football to what was felt to be a very “soccer-rich” area and they became the only American team in the PCSL Premier Division with trips to Vancouver, Victoria and Kamloops in amongst all that. Adopting the motto “United in Soccer” to represent the united communities within Whatcom County, Bellingham United are continuing to go from strength to the strength both on and off the pitch. They have built a strong fanbase and excellent support from local business, with 19 official club partners on board. Community is definitely the feeling you get from attending a Hammers match. The buy-in from the locals seems phenomenal for a club that is plying it’s trade in what is effectively a summer league in the 4th and 5th tiers of the North American football pyramid. They attracted an average crowd of 1170 last season. This year that has dipped a little in the early matches due to a number of scheduling clashes with other big local events. Despite that, they’re still managing a very healthy average of 867 and I would expect that to rise into four figures by the end of the season. It’s the kind of numbers that puts most of the local PDL sides to shame and Bellingham United would certainly grace that League with their presence and maybe even at a higher level than that. I’d love to be heading down there to watch the Caps play on a nice summer Sunday afternoon. They are happy with the PCSL though and not looking at anything else. For the club, what league they play in doesn’t matter. It’s about the local community and local players. If they were to move up a level they would need to have more focus on recruiting players from outside the area and they would lose the local feel that they have done so well to build. A good point was made to me. How many American fans actually know what the PDL is? The difference between that and the PCSL? If it isn’t MLS, it doesn’t matter to many. It’s a fantastic outlook and their whole ethos sits very comfortably with this bitter and twisted old fashioned football fan, so I’m glad they’re going to be around the PCSL for a while to come. 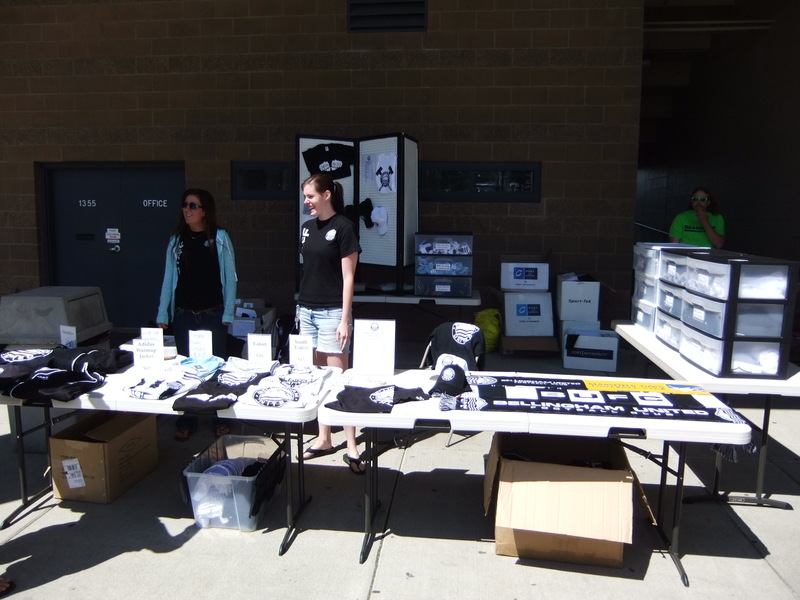 The BC based PCSL was reconstituted in 1995 as a summer league, although the original Pacific Coast Association Football League was formed in 1908 and there’s been a long and sometimes rocky history which you can read more about HERE. The League is now in its 19th year as its current entity, with a Premier Division of just eight teams and a Reserve division of a further eight. Bellingham United are currently top of the table on 25 points from 11 games, with Kamloops Heat breathing down their neck six points back but with two games in hand. Ranking it as a 4th tier League, which you technically can, puts it on the same level as the PDL and the NPSL in US terms, but it certainly doesn’t feel that way in terms of the exposure that it generally gets or the perceived quality of the teams taking part. Locally, the VMSL and the FVSL always have the feel of being the bigger and better leagues and run in a more professional manner. If you check the history out above, you’ll see why. To me, the PCSL has also felt like an afterthought (there wasn’t even a PCSL banner at the game so it could have been any league you were watching). Something players do to pass their time in the summer before the real league action begins once again in the fall. 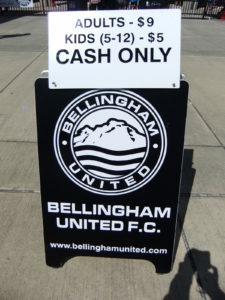 Bellingham United though are certainly doing an excellent single handed job at shaking that perception, with a professional approach to a semi professional team and showing the others what they could make the League. It’s a short regular season, running from around the end of April till mid July, with the top four teams in the league standings qualifying for the Challenge Cup tournament at the end of July to decide the League Champions. With the way that Bellingham United have been going this season, it’s hard to bet against them hoisting the silverware in a few weeks. The reason we called this article “A day out at Bellingham United” and not just a “visit” or just one of our usual “Groundhopping” title, was because attending the game you felt that you were attending a whole experience and not just a football match. 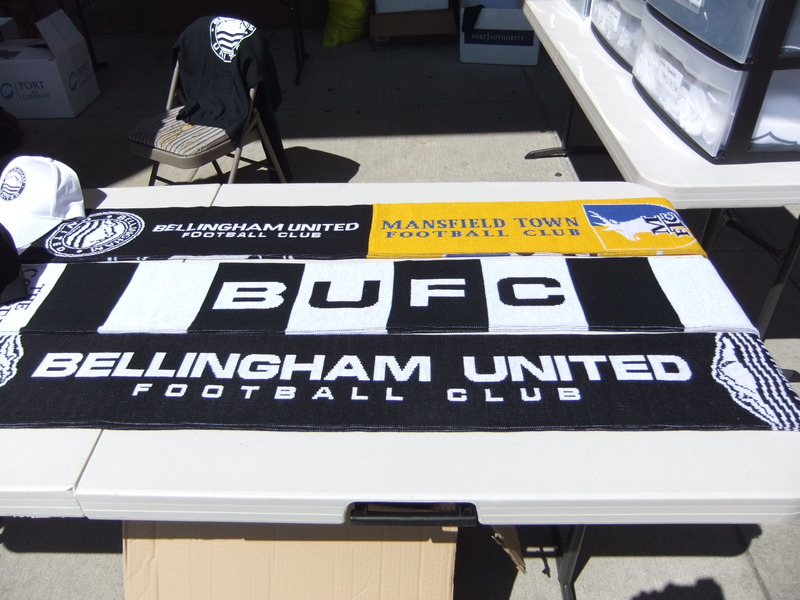 Bellingham United have set up home at the town’s Civic Stadium and from the moment you arrive there is a buzz around the place and a professional air to everything. The stadium was built in 1961 and was extended in 1971 with a further major renovation in 2006. There are two stands, providing covered seating for 4,000 spectators and floodlights for night use. 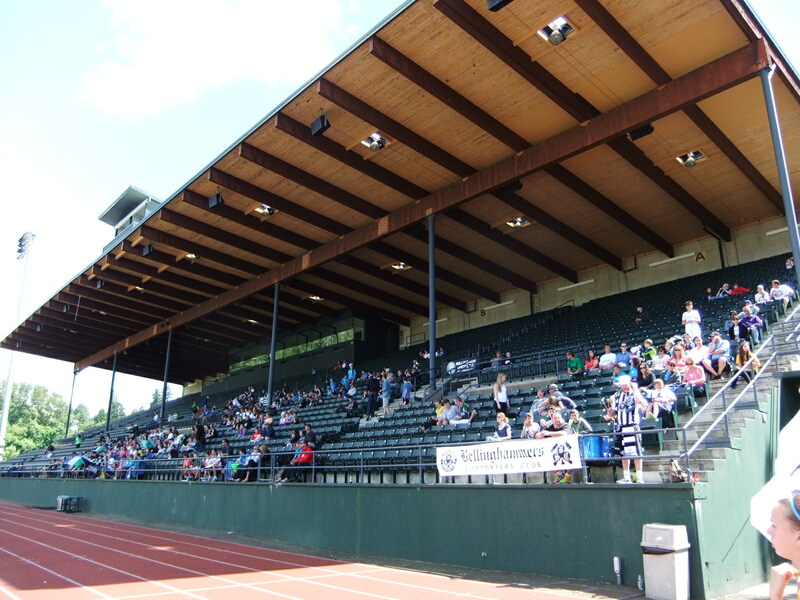 The main stand extends along the entire south sideline and hosts both sets of locker rooms and a press box. A smaller stand sits opposite and is around a third of the size of the main one. Both ends are open with no bleachers. 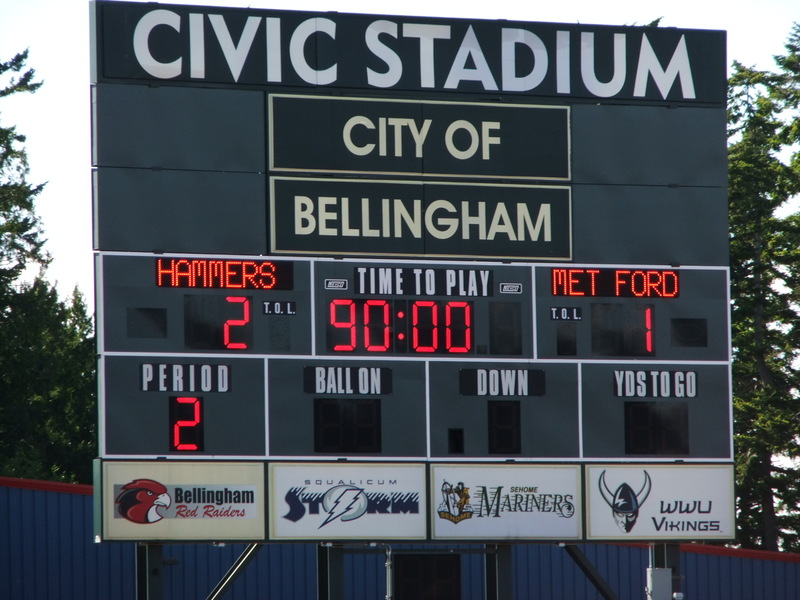 The scoreboard is at the west end, which also hosts the beer garden for Bellingham United games. As is the norm for multi-use fields, the pitch is artificial with both soccer and American football markings. The existing heavily worn natural turf field was replaced in the last major renovation with an infilled synthetic turf pitch. The field was installed over a permeable crushed stone base with a subsurface drainage system and has an eight lane 400 metre oval around it. The running track surface was also resurfaced at the same time and includes an interior trench drain that functions as an anchoring device for the synthetic turf. The soil material excavated from the field area was used as fill north of the track to provide a level field event area for pole vault, long jump, and javelin runways. It also provides a grass landing area for discus and javelin. Outside the stadium and there are Bellingham United flags and banners around the gates. The ticket office is situated to the left of the south stand entrance and admission is $9 for adults and $5 for children. For the game we were at, local soccer teams turning up in their strip got in for free. Upon entry we got a four page black and white copied programme and teamsheet and something which just blew my mind as a collector of football memorabilia – a double sided, full colour collector’s card of one of the players (midfielder Sean Connor for this game). I now want to go about getting the whole set! If you needed proof of the professional approach I’ve been talking about you have it right there. For me, it’s the little things like that that make the difference. Maybe non collectors won’t see that, but it really made me think, wow this is an impressive set up they have here. Take a few more steps into the concourse and there’s an even better example with the merchandise stall. There’s pretty much everything you could want as a United supporter. Replica tops, a selection of t-shirts, scarves galore, hats, stickers and so much more. Get your brand out there in the local community. If I hadn’t had less that $30 US left in my wallet I’d have got a strip. Next time for sure and there will be a next time because that’s what they’re hoping to achieve from their gameday experience. There was a small concessions (but they did have vendors going around the stand selling drinks) and some local charity and group fundraising efforts including a half time 50/50 draw, a silent auction and a “Clock Your Kick” competition which was tied in to the half time entertainment. 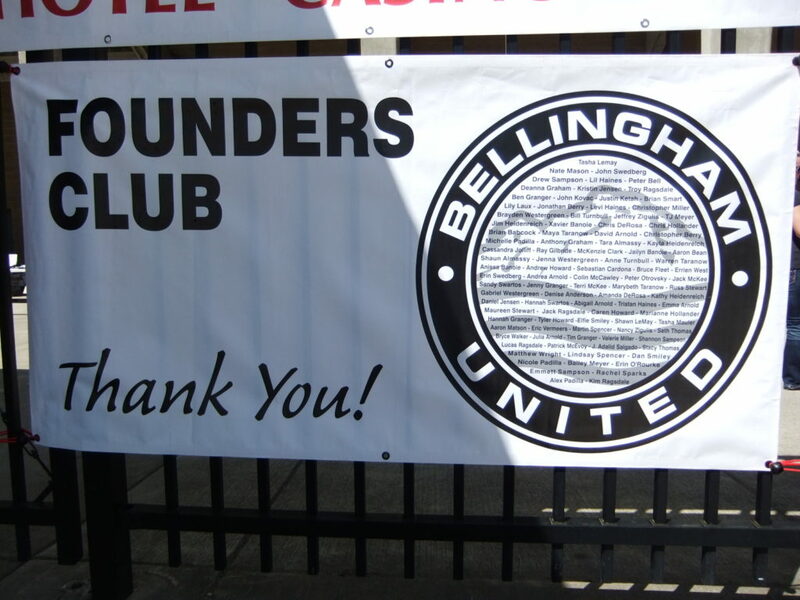 Bellingham United have two supporters’ group and a 100 people strong Founders Club. The Bellinghammers are found in the main stand, have a drum, are more family friendly and there were even Cascadian flags about. In the beer garden you’ll find The Hammers, heckling loud and proud and bringing back that old spirit of the Southside I miss so much from Swangard. There’s even a ‘march to the match’ two hours before kick off from a local pub sponsor. All the throw ins, corners and goal kicks are brought to you by a sponsor. It’s that old stereotype that us UK types always think about North American sports and whilst I still find it annoying, it did show the level of local business support they attract, so not going to knock them for bringing the sponsorship money in to survive and thrive. I could have done without the “how about a hand for the Hammers defence” blaring out of the PA at one point, but it was only the once. At half time there was the final of the hardest shot competition and kids through little plastic footballs into the crowd. After the game, the man of the match was presented with his prize black and white hammer and the players all posed for photos and autographs. It was quite the day out. The game itself was entertaining with a good standard of play, particularly from the home side. Bellingham were the livelier team and did most of the pressing in the first half before eventually finding the breakthrough when Coquitlam keeper Cam Frost could only parry a Brendan Quilici shot and Kellan Brown was on hand to poke home in the 41st minute. Coquitlam grabbed an unexpected equaliser five minutes into the second half when Russel Huggon scrambled the ball home from close range. Bellingham had a number of close calls as they pushed for the winner but the visitors found themselves with the best chance with ten minutes left when their striker found himself in acres of room but with time on his side volleyed wide. Just when it looked like the points would be shared, Bellingham popped up with a 91st minute winner when Quilici rose well to head home a deep Kurtis Pederson cross. The goal sparked jubilant scenes in the Copper Hog beer garden and a pitch invasion, as you can see from the video below (along with tail end of the goal). It was great to see winning the PCSL title means so much to them or maybe it was just the alcohol! In all seriousness, it was wonderful to see the passion and the enthusiasm of their supporters throughout the game. Bellingham United have worked hard to build up a community club that is a credit to that community. And the community are showing the love and support back, which is also excellent to see. The team have three home games left this season, the next one being at 3pm this Sunday against Khalsa SC. It’s worth heading down to try and catch some of the action. Drop your partner off for some cheap shopping if they don’t want to head along. We have nothing but good things to say about Bellingham United and wish them all the best for the rest of the season. They’re a local club doing it right and in this day of money grabbing modern football, that’s very pleasing to see.